I don’t watch UFC or MMA fights but I want to talk about something to make a spiritual point. This weekend’s UFC 229 became big news and trending on social media because of the Khabib Nurmagomedov versus Conor McGregor fight. If you didn’t know Russian Khabib Nurmagomedov defeated Irishman Conor McGregor. I’m no fan of McGregor; he’s vulgar, crass and plainly has no class. I’m happy he was defeated. I’m sympathetic with Nurmagomedov. 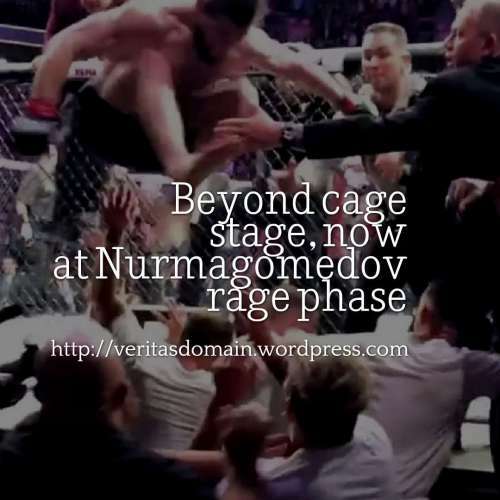 But Nurmagomedov then did something shocking. After his victory he spit at McGregor. He then threw his mouth piece and jumped out of the octagon to attack someone on McGregor’s camp. Chaos followed. Sadly so many times in moments of passion and rage people don’t think about the consequences beyond the heat of the moment. He might even be stripped of his victory. I saw this headline that “Khabib Nurmagomedov’s father says he’ll punish son ‘tougher’ than UFC does.” I know in a lot of today’s news headline the mainstream media can demonize the Russians. But here I thought Khabib’s father show real class. The father is a professional. A professional fighting coach. This man is intense. He’s had his own son at a young age train by wrestling bears. That’s crazy. There’s video of that on Youtube. So when I saw the headline that Khabib’s father is going to punish his son tougher than UFC does, I don’t want to even try to imagine what that looks like. Somehow I don’t think his dad is exaggerating. I really respect his father for saying it. Outside the Octagon there’s civilians. Something about it speaks to me that makes me not only say “Amen,” but a Marine “ORAH!” Obviously Khabib is skilled in fighting. But with great skills also come great responsibility. Responsibilities towards others.